Mindika Moments: Monday Moments - More details on the Gingerbread House! Monday Moments - More details on the Gingerbread House! After my post last week on our gingerbread house tradition, I've received several email requests wanting more information on how I make, and the recipe I use for the gingerbread houses. It's fairly simple. I use the John Wright Gingerbread house molds. They are cast iron and so easy to use. You don't have to roll out the dough, you simply press it into the molds. A sample of the mold is pictured here. These molds are available online at Amazon and I've seen some on Ebay. They run about $25 - $35 a piece depending on the design of the house. It may seem pricey, but they will last a lifetime or two. 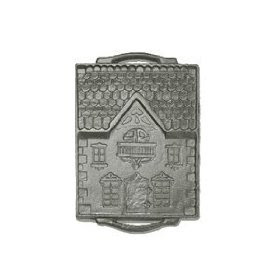 Paula Deen has also come out with a line of Cast Iron Gingerbread house molds, sold at Walmart. They run about $20 - $25 per mold. I haven't used them, but I'm sure they work great. As for the recipe. I use the recipe that came with my mold. I really like this recipe because it doesn't have any eggs or leavening which keeps the gingerbread house from getting too "puffy" and it cooks up nice and hard. This will make for a sturdy structure that won't fall apart. The only down side; you wouldn't really want to eat this gingerbread. It is edible, but a little too hard on the teeth. 1. Cream together shortening, sugar, molasses and water. 2. Sift together flour, spices and salt. 3. Add dry ingredients to shortening mixture and mix well. 4. Dough will be stiff. If dough is still crumbly, add a tablespoon of water. 6. Press into your mold or roll out and cut into gingerbread house shapes. 7. Bake at 350 degrees for 25 - 45 minutes, depending on the size of your mold or shapes. As for the royal frosting I use. 1. Combine in a mixing bowl and mix on high speed 7-10 minutes. 2. Beat until very stiff - you can't over beat. 3. Store at room temperature, in a covered container. The finished product...keep in mind we are not professional decorators. But we sure have fun trying to find unique candies and food to use in the decorating process. This year I kept it a little more simple. The big house is tiled with Cinnamon gum, and the trees are made of fruity pebbles. The smaller house has a roof of shredded wheat. Next year I really want to go crazy with a little more color and crazy candies. I have a feeling little "R" would like that a lot more.